Second-grader Ben Fowler prepares to high five Wally after Friday's assembly. Rock, Paper, Scissors with Wally. 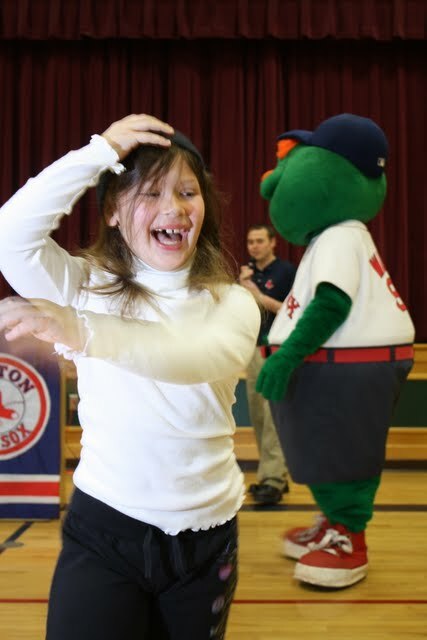 DERRY -- As Red Sox players prepare for spring training this month, mascot Wally the Green Monster kicked off his literacy tour Friday with a stop at Barka Elementary School in Derry. The mascot, accompanied by team rep Mike Prizio, spent about an hour reading aloud to the children during an assembly. Prizio said Wally and the team visit between 10 and 20 schools each year, as part of a literacy program in its third year. The Red Sox partner with the Massachusetts Teachers Association. Barka Principal Daniel LaFleur said he invited Wally to come to the school earlier this year, hoping it could rally students. And the students at Barka were full of energy Friday, forming stadium- style waves and shouting, “Wally, Wally.” Fourth grader Amie Wildes described the day as “awesomely awesome.” And while Wally lifted their spirits, Wildes and her classmates said they are already passionate about reading at Barka. “It helps to you expand your vocabulary,” said Makayla Perez, 9. “Books can bring you on an adventure,” said 9-yearold Jayden White.